Why have an email newsletter? Promotion of business – such as sales, new projects, portfolio pieces. Any retail business, especially those with an e-commerce storefront, should be using email marketing to promote new products, sales, and special deals. Business-to-business companies can promote new projects, services, portfolio pieces and more. Any business can tout growth, new employees, and so on. Building brand loyalty. Communicating regularly with your best customers — after all, only people who really want to hear from you will be on your email list — helps increase loyalty, especially if you reward them for being on your email list by offering them information they can use, promo codes, advance notice of sales and so on. Promoting your content marketing. It should be noted that if your website is lousy, you should focus your efforts there — most marketing email includes links to your website, so that the reader can read more, make a purchase, or whatever. But if you do have a strong website, you can use email marketing to direct your customers to your content marketing (such as the Learning Center post you’re reading now). It provides the best ROI of any form of marketing. Once you have your email marketing system set up (more about this later), cost to use it is minimal and may even be free, depending on the number of addresses you mail to. The main cost is the time it takes to plan, write and send an e-newsletter. 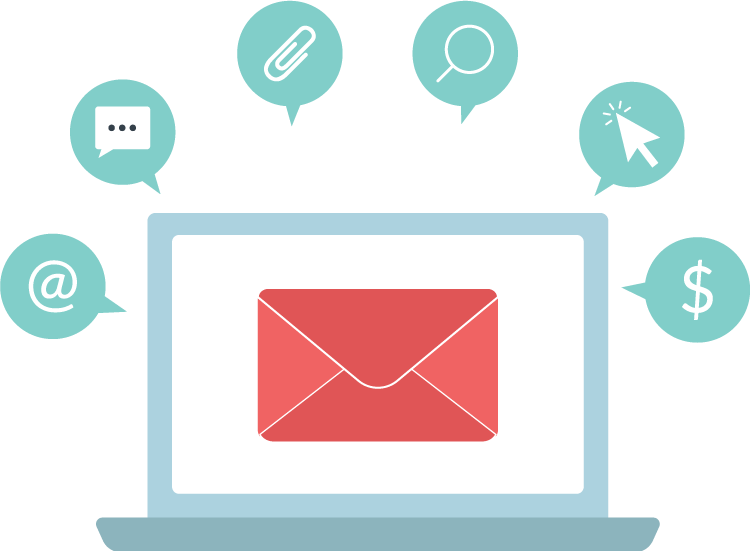 Email marketing consistently provides the best return on investment of any form of marketing. Your email list is all yours – you’ll always be able to use it. It takes time to build a good email list (more about this later), but once you put in the work and have a good list, it is yours forever. Many small businesses spend an inordinate amount of time building their audience on social media, especially Facebook, because they like and understand Facebook and it’s easy to get started. But rules of engagement on social media can change at any time without warning, so prioritizing social media marketing is like building a house on borrowed ground. Email marketing can reach your most important supporters really fast. Most paid marketing requires a good deal of time, effort, and money, while email marketing can be rushed out the door in a matter of hours. So if you decide to, say, have an inventory reduction sale, you can let the people who are most invested in your business know right away. A variety of email newsletter services providers are available — among the most popular are MailChimp, Constant Contact, and Campaign Monitor. These services will do a great deal of the work for you, including managing your subscriber list, spam filters, allowing people to unsubscribe, and so on. They are very user-friendly, allowing you to readily create and send campaigns, or schedule them to be sent at a specific time. You will receive reports with detailed analytics showing who opened your message, clicked on links, and so on. Cost varies with the service, but MailChimp is “forever free” up to 2,000 addresses. That means there is absolutely no charge to set up and send emails to up to 2,000 addresses. Once you exceed that number, pricing is tiered but still fairly nominal. All services include the ability to set up a do-it-yourself email newsletter. A better route is to have a template professionally designed to match your existing branding, including your website — which is essentially your only hard cost to getting started. “Responsive” simply means that the email responds to the screen size of the device being used to view it, so that it looks great and is easy to read. For technical reasons, it’s harder to code responsive e-newsletters than it is to code responsive websites, which is why many marketing emails still look lousy on a mobile phone. But since people read such a significant percentage of email on their smartphones (up to 60%, depending on the demographic), it’s vitally important that your email template is responsive. Subject line. This is the most important part of your copy — like a newspaper headline, it is often the only thing people read, and determines whether they’ll choose to read further or not. In your subject line, you might tout promo offers or anything that conveys a sense of urgency. Tease slightly — for example, you might write, “our new collection is here…and it’s the prettiest one yet!” This is more interesting than “now in stock: our new collection.” AVOID ALL CAPS (as nobody likes being yelled at, or too many exclamation points!!!!!! Content. The best enewsletters provide information that’s useful to the consumer, not purely news about the business. Send content your subscribers want and need — as well as promotion! This can include links to helpful blog posts (but don’t send the entire post – have them click to your site). Your copy should be relatively brief — if you have more to say, include a link to your website. Images. Including a strong image can add to the overall interest of your enewsletter, especially if whatever you’re selling or promoting has visual appeal. Header, footer, and other information. Email newsletter providers will automatically include all of this information, including ways to forward the e-newsletter, an unsubscribe button, and more. Okay, so, you have an enewsletter and have sent your first campaign, and are getting ready to look at your analytics. What should you expect? Open rates will seem low. Open rates are recorded when a subscriber’s email client (such as Outlook) downloads the images — but most email clients do not download images automatically (instead, the subscriber must click to download). This means your reported open rate is artificially low. On the other hand, the “total opens” will be high, as some people will open the email multiple times. What’s considered a “good” open rate? Depends on the industry, but averages somewhere around 20 percent. Click rates. The click rate tells you what percentage of people who received the email clicked on a link. The “clicks per unique opens” statistic tells you what percentage of people who opened the email clicked on a link (and thus will be much higher). A good click rate is somewhere between 2-3 percent. Bounces. People change email addresses more often than you might realize. The good news is that an email newsletter provider will maintain your list when email newsletters bounce, or are not delivered. A soft bounce means that the email address appears to be active but a temporary issue is preventing delivery (this could mean a mailbox that’s full, the email server is down, etc.) — after several soft bounces, the email service provider will assume the address is defunct and delete it from your list. A hard bounce means that the email cannot be delivered for a permanent reason (such as the address or the domain no longer exists), and the address is removed immediately. The key thing to remember about building an email list is that it takes time. You can add new addresses to your email list manually, upload lists in a spreadsheet (although see restrictions on this below), or people can sign up to your list directly through forms. You cannot simply upload all your email contacts into receiving your e-newsletter — that’s spam. You must explicitly have their permission. Never buy lists of email addresses. This is a terrible investment. On the other hand, it is possible to buy an e-blast from a commercial vendor that is tailored to your target audience, but there you’re buying the e-blast, not a list of addresses. Have a physical signup list at your place of business. Let people know what to expect from you. Promise special offers. Special offers — one-time or on an ongoing basis – can be a powerful incentive for someone to opt into your email list. Ask contacts if you can opt them into your list. Business-to-business companies should ask their employees to do this on sales calls, at networking events and so on. Make a regular habit of manually adding the addresses you collect. Include a box for “sign me up for your e-newsletter” on contact and purchase forms. Allow people to opt in anywhere you collect customer contact information. Add a signup form to your website. Email service providers make it easy for your developer to add this to your website, so that the address is added to your list without you having to lift a finger. Prime has a signup form on home page as well as in our Learning Center, there to the left. Integrate your signup form with social media. MailChimp users can, for example, add an email signup form to their Facebook Pages, so that someone browsing the page can sign up for email. MailChimp makes it possible to get more mileage out of your e-newsletter by sharing it socially on Twitter and/or Facebook. You’ll find this in the “setup” section when you create the campaign. Simply follow the commands to link your social media accounts to MailChimp, click the boxes, and write the post or tweet. Not only does this provide more content for your social channels, it also helps promote your e-newsletter to your social network.